This is Part Four of an ongoing series of the history of Minnesota’s trunk highway system. Part One covered the early days of government and privately built roads. Part Two covered the events leading up to the establishment of the trunk highway system in 1920. Part Three covered the coming of the U.S. numbered highways and the 1920s improvement projects. Throughout the 1920s, focus was on improving the existing trunk highways. But beyond the original 1920 Constitutional Routes, the legislature was given authority to add routes via ordinary statutes. In the 1920s one route was added, and an attempt was made to add a second but was declared unconstitutional due to a technicality in the way the statute was written. But the drips being added to the system soon became a torrent. In the early 1930s the initial improvement program was nearing completion and with the coming of the Depression, Governor Floyd Olson championed a massive increase in the size and scope of government, including a mammoth expansion of the state trunk highway system. This put him at odds with Charles Babcock, who was reluctant to take on new routes, both because of their dubious value for statewide mobility and due to the resources required to maintain them. Ultimately Babcock was forced out of his position as commissioner of the Minnesota Department of Highways, the agency he did so much to create. Olson appointed a new commissioner who agreed to accept the expansions, which were authorized in 1933 and signed by 1934. With the new highways came new numbers. Originally the marked numbers matched exactly the legal numbers. But with the expansion came the opportunity to redo it in a less legalistic, more pragmatic manner. The new routes were assigned arbitrary marked numbers from 73-121, and existing routes were renumbered to incorporate the new highways into the system in a logical manner and eliminate duplication of U.S. routes. Until then, U.S routes had both the new U.S. and old constitutional route numbers. Here’s a map of the state showing the 1933 expansion and the changes since the 1920s. 1933 Minnesota Trunk Highway Expansion. I have left out route numbers for legibility and because with a few exceptions they are the same as today. Notable exceptions are that part of what is now MN 30 was then MN 47, part of what is now MN 47 was then an extension of MN 56, and part of today’s MN 18 was then MN 66. Here is a map of the Twin Cities metro showing the 1933 additions after they had been established in 1934. Since the map in the previous post showed the temporary 1934-1935 extensions of U.S. 65, 212, and 218, I’ve chosen to show them in their longer lasting configuration here. There used to be two routes east from downtown Shakopee. One followed the railroad to the Bloomington Ferry Bridge, and one followed what is now Eagle Creek Blvd to the southeast. MN 13 and MN 101 originally followed Eagle Creek until the connection between the Bloomington Ferry Bridge and CSAH 5 was built later. I’ve called out the MN 100 belt line for special attention. It was originally “U” shaped. The top was closed 10 years later by following the existing MN 96 (which I have also shown in solid yellow on the overview map) and some newly constructed roadway (dashed yellow). With the coming of the interstates that replaced portions of it, the numbers were broken up. The longest section in the western suburbs remained MN 100, with MN 110 in the southeast and MN 120 in the east. The section overlaid on MN 96 just reverted to that. Note also MN 101 and MN 110 in the western suburbs—it’s possible that these were anticipated as a series of belt lines. At any rate neither was extended, and in fact the original MN 110 was the first highway removed from the system in the mid 1950s and MN 101 is now mostly gone. MN 94 only lasted a year or two before it was replaced with a reroute of US 10. MN 56 originally went all through the metro and continued to Lake Mille Lacs. It was broken up by deleting redundant sections between the downtowns and renumbering the northern segment MN 47, then by ending it at Hampton and renumbering the part of Concord Blvd remaining as a trunk highway as MN 156. MN 218 went north from Owatonna to Brainerd, and was replaced with MN 3 and an extension of MN 25. Note the sequence of numbers 94, 95, 96, 97, and 98 around the western suburbs. MN 55 followed Rockford Road (so named because it was the main road from town west to Rockford in the early days). The Olson Highway expressway much farther south was a 1950s conception. MN 212 is the route that continues through Stillwater and over the bridge to Wisconsin. Here are some closer maps that incorporate some changes from 1935 on, including the final pre-interstate alignment of the Belt Line, 1941-c1958. Dashed lines are where a preexisting marked connecting route was moved onto a new alignment when it became controlled by the state. MN 7 comes all the way into Minneapolis and ends at Washington Ave. The intersection of Third Ave and Washington Ave in front of the Milwaukee Depot was sort of the crossroads of Minneapolis. US 212 has been moved to Marshall Ave, where it will stay for 50 years. The High Bridge route is MN 88. Later, MN 49 was extended south over it, then it was reverted back to two separate routes, renumbering to the current MN 149. Then the original MN 49 on Rice Street was removed. MN 218 goes right over what is now part of the grassy area in front of the state capitol. I’m not going to get into the whole long convoluted history of MN 90 (and its successor MN 190) and MN 121 in south Minneapolis. If anyone wants to hear about it we can go out for coffee sometime. Overall the value of these new trunk highways was mixed. Some of these were extremely valuable, for example the Twin Cities Beltline, MN 100, and MN 36. But many were marginal to worthless, including some roads in the northern wilderness that still average only a couple dozen vehicles a day, as well as LR 199 / MN 105, which parallels US 218 and then ends at the Iowa border. As for Charles Babcock, he returned to his family affairs in Elk River, passing in 1936. The Babcock family is still involved in the affairs of Elk River. Some of the staff Babcock hired to help lead the Department of Highways lasted into the early 1960s before retiring. There are a few public legacies of his involvement: the street name “Babcock Trail” in the southeastern suburbs and a wayside in Elk River. Two practically opposed ideas that really started to gel in the 1930s were that motoring could be fun and that motoring could be fast. The idea of motoring for fun has spanned the years—from a picnic excursion in a 1918 Ford Model T to a Sunday drive on the Grand Rounds in a 2018 Ford Escape. It first became practical in the 1930s because car ownership was common and you could take a pleasure drive without a real risk of getting stuck or breaking down. The Depression put traditional benefit/cost analysis for government projects on hold, allowing for the creation of roadways that encouraged pleasure driving. Parts of MN 100 were built with with hand labor, rather than the mechanized equipment that was widely available, just so more people could be paid to work. In the 1930s the New Deal agencies built a series of roadside retaining walls, bridges, waysides, and entry monument signs out of hand-set stones. Although the modern rest area is mainly a place to use the restroom and get out of the car for a few minutes, the early waysides could also be destinations for a picnic after a pleasure drive. On MN 100 a series of 9 of them were built, featuring rock gardens, picnic areas, and landscaping. The highway itself was extensively landscaped, notably with 7000 lilac bushes giving it a secondary name: Lilac Way. 1960s era map showing west metro waysides. The second legacy of the period is the idea that motoring can be fast. Traffic signals and city congestion were fast becoming as big an infringement on the freedom that autos brought as the mud and rocks of only a decade or so before. MN 100 was the beginning of the idea that you could get around without having to go into city congestion. Although parts were still gravel when incorporated into the trunk highway system, this would soon change and some of first interchanges and stretches of expressway were built on MN 100 in the mid to late 1930s when German immigrant engineer Carl Graeser got to work. Ultimately it became clear that the two concepts really couldn’t exist in the same time and place. Speeds and traffic volumes got higher and higher, making waysides unpleasant to picnic in and dangerous to pull into and out of. In the case of MN 100, fast unquestionably won over fun. Most of the original landscaping and waysides along MN 100 have been obliterated by capacity improvements over the years, and few people aside from roadgeeks drive it for pleasure. Here’s an approximate modern view of the place pictured above, taken from Google Street View since I can’t legally and safely stop to photograph a high-speed freeway entrance ramp. Only the location of the overpass in the background gives you a clue it’s the same location. The idea that motoring could be fast and efficient was of course much, much bigger than the MN 100 belt line in both Minnesota and the nation. Additional expressways were being built here and there; Hudson Road was another early one. By the late 1930s the idea for a national system of such high speed expressways came about which would become the interstates. It would take decades to realize the dream. There was no workable mechanism for funding, and then the U.S. got involved in a little kerfuffle in Europe and the Pacific. But the dream was still there, and it’s surprising how similar the 1930s proposals were to what became reality. Such topics as Lilac Way, driving for pleasure, and the dawn of the interstates are topics that easily deserve their own articles, so for now this series will narrow to focus on the changes to the non-interstate routes. Part Five will cover two much more minor waves of expansion in the 1950s and statewide additions since then. Part Six will conclude the series with the reverse wave of highways removed from the system, changes to the metro since the 1950s, a discussion of the secret highway numbers, and possible changes in the future. Late 1930s national expressway proposal. Question for you on old 100: present-day TH 5/494 commons (old 100) between Richfield and Bloomington has some very awkwardly spaced frontage road intersections. Portland Avenue on the north side is probably the worst, but several exist. They’re quite different from the setup on many other freeways (like 35W in Bloomington and South Minneapolis, where the frontage road is one-way and merges with on-off ramps). Do these rights of day date back to having a grade intersection at then-100? Or were they created along with creating a 494 freeway? Also interesting that TH 100 once jogged over to Louisiana Ave between Minnetonka Blvd and TH 12. Didn’t know that. The east-west portion of MN 100 through Bloomington wasn’t upgraded to expressway before I-494 came, so everything built was new, except for the Lyndale Ave interchange; that overpass that was built in the pre-interstate days to provide a grade separation between the main north-south and main east-west routes through the area. I’m really curious about 121, which seems like it should have been reduced/eliminated long ago & which I’m not sure I understand why it was ever built (although it sounds like you’re saying it was once part of the interstate or something). 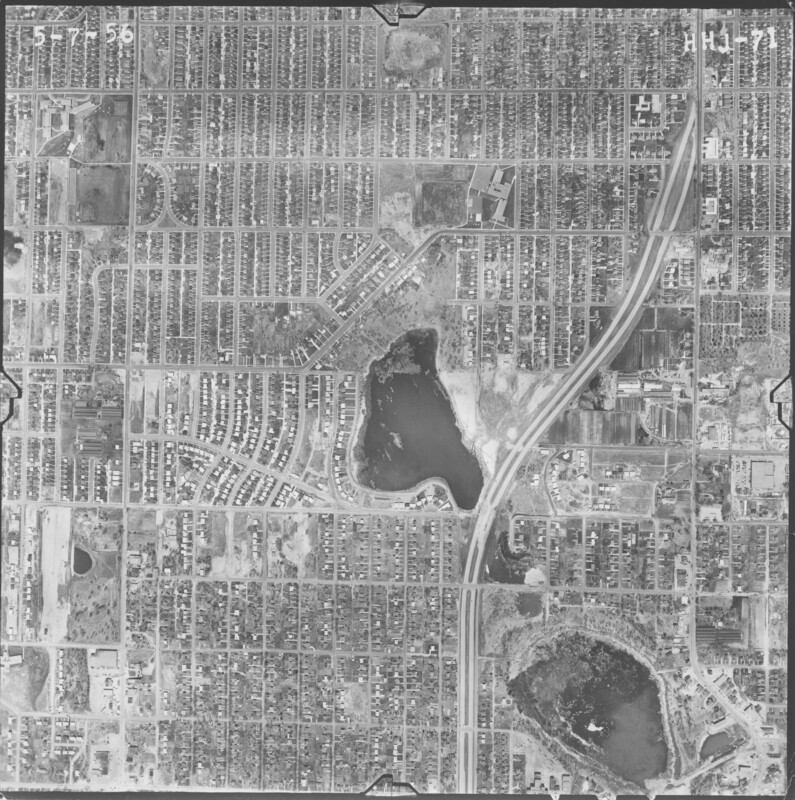 TH 121 was the northern terminus for the earlier Richfield/Bloomington expressway to merge onto Lyndale Avenue and proceed into Minneapolis. My understanding from Politics and Freeways is that this alignment was assumed to be a future route for 35W in Minneapolis, later changed to 2nd Avenue when it came time to build. Around page 19-20 they talk about the relative difficulties trying to make 35W straight-through in this area, basically taking a big chunk of out of commercial districts either way if it were more diagonal. Remember that TH 121 is turned back between 56th and 58th St, and now part of CSAH 22. Hennepin County and Minneapolis could change it if they so wished. Personally, I think that should be a high priority, to allow Lyndale Avenue to have two-way traffic all the way through. This 1956 image shows how it originally made sense. The current 121 section is basically exactly what now-35W was like in Richfield. It had to end somewhere, so it made a beeline for Lyndale right before it got the 54th & Lyndale commercial district. Before they got started focusing on building the interstates in earnest around 1960 a lot of the early expressways they built the “easy” parts in the suburbs first, coming to an abrupt end at or near the Minneapolis or St. Paul city limits. See also CSAH 25, Bottineau, US 61 in north of St. Paul. I-35W was the same story for a short while. I-35W was never not signed as an interstate. But my point (that I’ll likely expand on in a future article) is that the interstates were a gradual evolution from an ideology that started in the 1930s, not Eisenhower coming up with a brainstorm in the 1950s and then an immediate reality. Once the decision was made to build the Minneapolis section farther east (I have a very early sketch that shows it close to Lyndale Ave) Hennepin County’s decision to build an East-West freeway made things easier. Also they elected to use part of the Crosstown for US 169 rather than building and expressway diagonally through Edina closer to where it use to be on Vernon. The old US 65 south of where I-35W originally touched Lyndale was immediately turned back, but the bypassed I-35W and Lyndale north of there stayed trunk highways for a while (as MN 190). I’m assuming your question is more why it was built and why it’s still there than why it has that number, so I won’t go into the long, complicated story of all the different routings of 90,190, and 121 in south Minneapolis. Point is the old I-35W and Lyndale north of there were gradually turned back in phases, and the part south of 58th just hasn’t been, likely because changing things just hasn’t been a big priority of anyone. The same problems seem to exist world-wide if your articles and questions and responses in this issue are a reflection of what happens. One of the biggest would seem to be NIMBY – “Not In My Back Yard” when it comes to extensions and widening. That was blamed for a Queensland Premier losing an election. The subsequent Govt widened the main road, and now, some years later, the congestion (and crashes) leads to calls for a new similar road to be built! The question of tolls also raises it’s controversial head, with many toll roads from the last 10 years not living up to the predicted loading. Happy times!! Inner city congestion, and falling bus/train use are currently exercising Govt as well as City Father minds, let alone us poor commuters. Another thing with the north end of 121 and the old 65 expressway (which was planned pre-1956-Highway-Act) that Monte didn’t mention: there were a few options studied that would have had I-35W better utilize what was built 1956-1959 and angle from roughly 60th over to 2nd in the vicinity of Diamond Lake Rd instead of following the Crosstown. Planners opted for the Crosstown Commons instead because of Hennepin County’s plans for an east-west expressway that surfaced in a 1959 report and there was “cost savings” in joining the two routes together. Of course, as well all know, that resulted in other problems…problems which were identified as early as 1968. Minor clarification: the national expressway proposal you include a map of at the end is from the 1939 report “Toll Roads and Free Roads” that was submitted to the President and Congress. It was the first report on what a national expressway system should be sized at and whether to toll it or not. This map was the tentative proposal (clearly changed in later reports).